Top Dead Center: Commonly referred to as TDC is the point where the piston is up. Power stroke: On a 4 cycle the engine produces power every other time the piston is up, while the piston and crank are in the same position (TDC) every turn the cam turns ½ of crank speed so the cam is in its position to adjust, both cam lobes facing down every other turn! Thus you can not just put the piston at TDC and adjust, the odds are 50/50 that the cam is in the right spot. 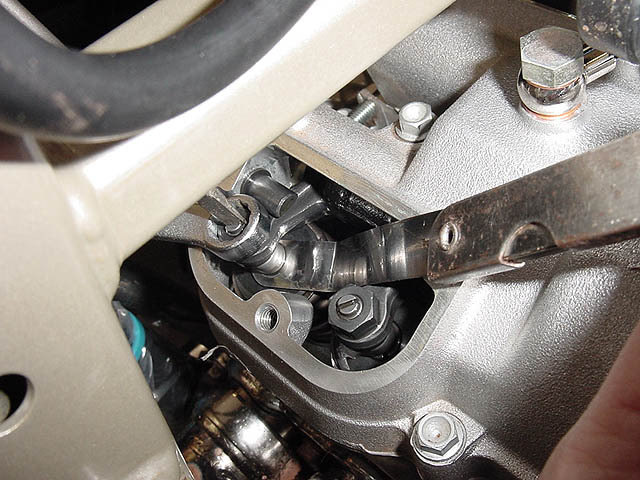 Overlap stroke: The other turn where the piston reaches TDC is called the overlap stoke, the valves are each open very slightly, approximately 1mm with the exhaust closing and the intake opening. Not the place to adjust the valves! Clearance: To allow the valve to fully seat and transfer the heat it accumulated when open, and to allow for heat expansion when hot, the cam shafts lifting pattern and valve train are designed to operate with "clearance" "lash" or "gap" between the valve train and the valve. Too much clearance and the cam and cam followers are prone to wear out. To little clearance and it can burn a valve, or if you are luck, just not start at all so get it right. 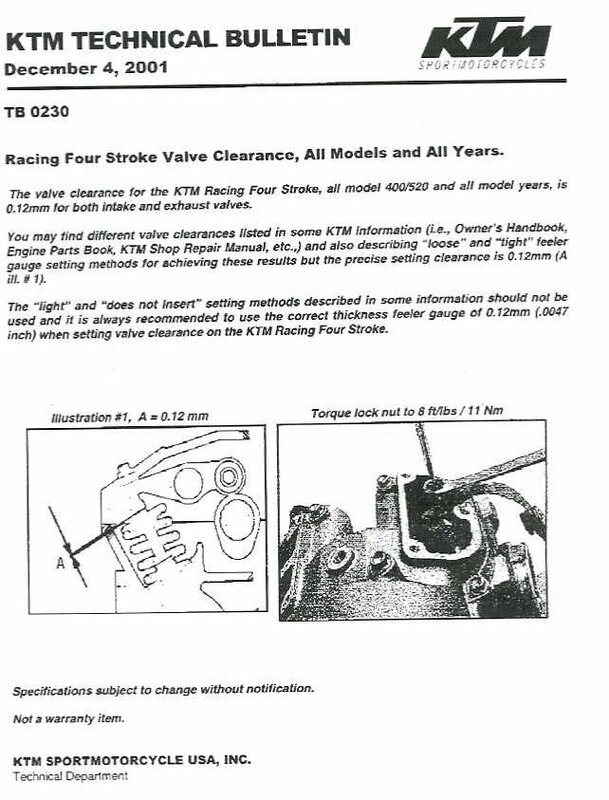 KTM has a service bulletin recommending that we ignore the prior specs and set the valves at .12mm which in inches translates pretty closely to .005". Somewhere, someone came up with the theory that 1/6th of a turn will do. That crude method could be used in a pinch as a turn equates to .75mm and.75 div by 6 = .0125, but to do this right we need to "feel" the drag on the feeler gauge! The factory made the specs where they are for good reason and these pieces are expensive, why risk damaging your engine to save buying a feeler gauge! Rotation: Note that the engine rotates the same direction as the wheels and that when we rotate the engine we are fighting the valve springs, the easiest way is to put the transmission in top gear, this gives the wheel max leverage against the engine, conversely to how 1st gear gives the engine max leverage against the wheel. If you want to avoid pulling the spark plug out you can, just hold the manual compression release while turning the engine. The factory way: Remove the skid plate, with an 8mm allen wrench locate & remove the bolt that is in the bottom of the crankcase looking like it is screwing into the crank, (not the oil strainer that is in the bottom of the trans) remove the thick washer and screw it most of the way back in. Next remove your ignition cover (with care, the gasket is $11.) then with a 17mm socket and flex bar (not a ratchet!) rotate it left, same direction as the wheels turn. Watch the intake valve, it will open (down) then close. Continue about another ¼ turn while watching the flywheel, there is a small steel block welded to the flywheel and when its clockwise edge matches the top edge of the pickup coil (electric piece in the 2:30/3 O clock area) that is TDC for the crank. At this point try screwing the 8mm allen wrench bolt in the bottom of the engine the rest of the way in to a notch in the bottom of the crank while rolling the crank gently side to side. Now if you did that right, did not make another turn of the crank after the intake valve closed, you are in the right position to adjust both valves. You should double check, if there is play in the rockers you are ok. IF there is no play you are while at TDC you either have no clearance and really needed this adjustment OR you made a full crank turn after the intake valve closed and have the cam ½ turn off! 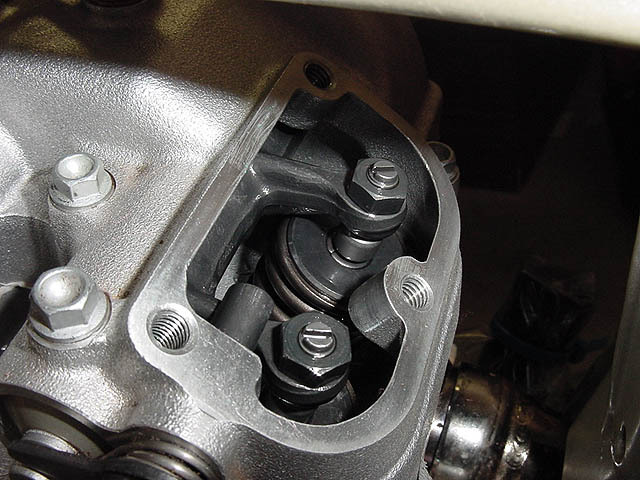 My way: With this method you do not need to remove the spark plug, magneto cover, skid plate or the TDC bolt in the bottom of the crankcase or the associated dirt. 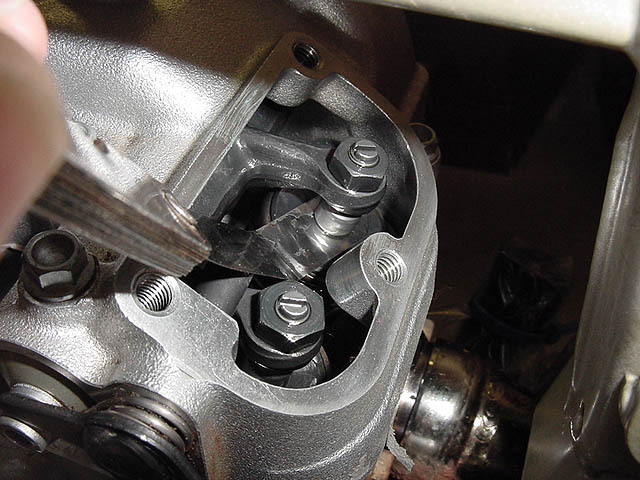 Intake valves: Transmission in top gear, rear wheel off the ground, if you have a helper one can watch the valves and hold the manual compression release while the other rotates the engine with the rear wheel. Rotate the engine gently with the wheel to locate the point where the exhaust valve starts to open. Rotate very gently until the exhaust valves are 1/2 way open! Minor frustration, we are now fighting against the valve spring which wants to roll the engine back so to stop it you either have to have a helper hold the rear brake or, as this gets pretty boring I prefer to slip a bar thru the rear spokes below the swing arm so the wheel can't roll back. Proceed to adjust the Intakes as the intake is on the heal of the cam! The heal of the cam is very broad, the engine does not need to be at TDC and this method is easier and just as reliable. Exhaust valves: As above, except, Locate the point where the intake valves have opened and are 1/2 way closed (engine rotating forward). 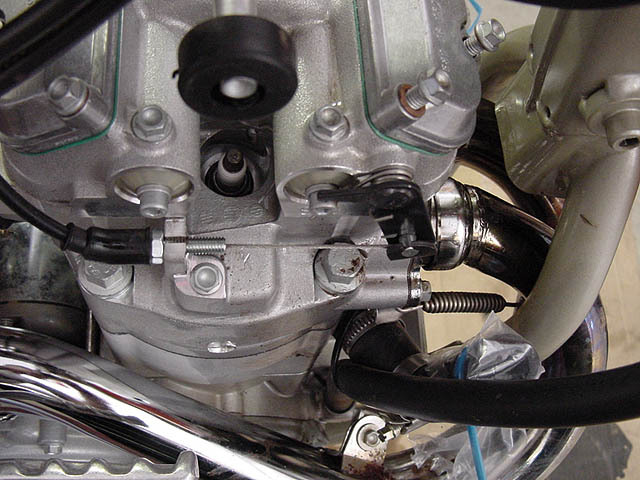 As the intake is closing the engine will want roll forward PAST the ½ way point and the lash in the transmission and chain will make it so you can not stop the engine so let it go just past, then roll the wheel backwards and put that bar thru the spokes above the swing arm where the intakes are ½ open. They are now opening instead of closing because the engine is turning backward! NOTE: On the KTM engines it is very important that the valve be ½ way, if it is fully closed you could be adjusting on the automatic decompressor, ½ way closed!! Proceed to adjust the Exhausts. ALWAYS! ALL 4 STROKE ENGINES: With the engine rotating its correct direction the exhaust is adjusted when the intake is closing and the intake is adjusted when the exhaust is opening! Adjustment: As the clearance is so small and you can not get a straight approach with the feeler gauge don't be surprise if you can not get it in. I like to loosen the jam nut (10mm box wrench) and loosen the (one at a time) adjuster a couple of turns, slip the gauge in, turn the adjuster down lightly against it, then tighten the jamb nut. In doing so often the adjuster will creep tighter slightly and cause the clearance to close up. What you need to do as you tighten the jamb nut is do kind of an isometric exercise where you are holding the adjuster against rotation with equal and opposite force of the rotation of the jamb nut! This may take several practice attempts. As soon as you have tightened the jamb nut, do not pull the feeler gauge out, just try to slide it around in the gap! When you have it right it should slide with some, but minimal drag or resistance, no drag and it is too loose, heavy drag and it is too tight, may even be holding the valve open? Take a little time, you will have to redo a few times at first but once you pull the gauge out you may not be able to get it back in so get it right first! Get out the torque wrench, check the factory spec and torque it down. Problem is with that is your locked into using a socket so you won't have the screw driver resisting movement of the adjuster, if the torque was close it should be ok. If it turned the nut much it may creep the adjuster around and changed your clearance setting. Thus what you have to do is be very close by hand before putting the torque wrench on it. Perfect way, fabricate a "crows foot" type box wrench so you can use the torque wrench and the screwdriver simultaneously. In doing so there is a leverage factor that needs to be computed to arrive at a different (lower) torque spec and you probably need four hands to do it. My way again. Put a nut and bolt together in a vice and torque to the spec, put the undoubtedly shorter box wrench on it to get a feel for how tight that is. Repeat a few times and feel how tight that torque feels. Then set the torque wrench aside and do it by hand. Now that we are done lets just double check our work, remove the bar from the rear wheel and rotate the engine forward to the checking points, hold it there with the rear brake momentarily and confirm a small amount of lash. Reassemble: Don't forget: add coolant, return the toothbrush to its owner, start engine, go ride.